Italy’s public opinion calls migrant day-labourers in the agricultural sector ‘new slaves’, but where are the voices of these workers in the debate? Photo by author. All rights reserved. According to a recent Eurostat report, Italy is Europe’s third largest agricultural producer, just after Germany and France, with an income of around €43 billion and almost a million agricultural workers. At first glance, this sounds like a success story. But is it really? Contemporary Italian agriculture also involves physical violence, illegal labour recruitment through the gang-master system of caporalato, ‘slavery-like’ working conditions for some workers, passport confiscation, social and physical isolation, disease and even death. It is populated by migrants from sub-Saharan and Northern Africa, Eastern Europe, and Indian Punjab. Yet these aren’t just ‘irregular’ or ‘clandestine’ migrants in search of a job. Since 2008, when the global economic crisis started, refugees, asylum seekers, documented migrants and in some cases Italian citizens have all become involved. They work in poor conditions, without regular contracts, and for poor wages, to produce cheap food to be sold at the lowest price in the supermarket. And although some call these workers ‘invisible’ because of their informality, in reality it is hard for 400,000 people to be hidden from view. How do workers react to their image of submission and passivity? Do they consider themselves ‘slaves’? Now, as a result of all this, some trade unions, media outlets and civil society organisations have begun to respond by depicting these workers as ‘new slaves’. But the voices of workers themselves are too often sidelined in such depictions. How do these workers react to this image of submission and passivity? Do they consider themselves as ‘slaves’? In the North of the province of Foggia in Puglia, thousands of African workers come every summer to harvest Italy’s ‘red gold’, the tomato. The majority are employed on day rates, recruited by gang-masters, and without a contract. But the poor living conditions that these workers experience, as well as the harshness of their work, are nothing new. They in fact represent a continuation of the Italian day-labour of the past many centuries. Until the mid-1960s, gang-masters hired Italian day-labourers to do the same work, and they too worked all day for poor pay and minimal social respect. From the 1970s onwards, then, migration has re-shaped the agricultural landscape to the extent that the workers have changed, but the working conditions remain very similar. Victims of hard work, exploitation and physical isolation, migrants nowadays live segregated in informal camps, called ‘ghettos’, deep in the countryside. 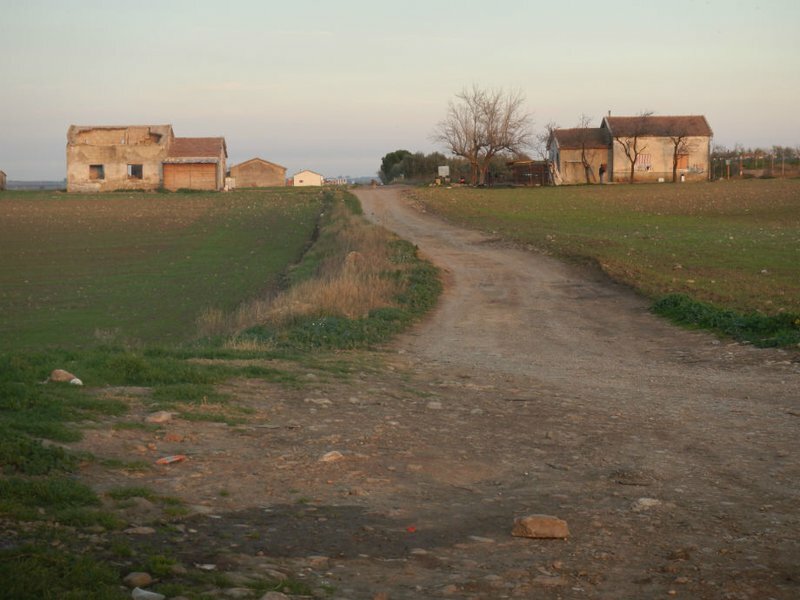 During my field research, I stayed in one of these ghettos, close to the city of Cerignola. It is inhabited by a community of Ghanaian workers and is therefore called ‘ghetto Ghana’. The camp is made of old and decrepit buildings – the former homes of one-time Italian day-labourers – with no furniture, electricity, running water, or sanitation. At the peak of the tomato harvest, between August and September, the ghetto can host up to 1000 workers, ready to pick tomatoes ‘from dawn to dusk’ for between €22 to €30 a day. The high temperatures, burning sun, and pesticides make the job even more exhausting. There is no pause except for lunch. “We usually have one hour to eat”, Moussa told me. “The capo [gang-master] decides when we can stop and gives us a sandwich and a bottle of water. But we pay for them, €3 for both. And when the time is finished, we go back to picking tomatoes”. The capo or caporale is a key figure in the management of their labour. Sometimes Italian, sometimes a migrant, he is in charge of several aspects of the labour process: organising the labour gangs, transporting them to the fields, overseeing the picking, and paying the workers. All these activities can be performed by one single caporale or divided between many. The capos do everything. They have power, they behave bad with us. They don’t want us to stop working during the day, they decide when we eat or drink. Many of us, they took our documents, ‘because they want to make contracts’. But it is fake, they just don’t want us to go around, they want us to depend on them for transport, food, everything. The capos sometimes steal your money, and if you ask for payment, they tell you you’re not going to work anymore. So I know I have to stay quiet or I can’t work anymore. The physical and psychological violence that are part of this work and that some caporali visit on their workers; the control over their mobility; the long and exhausting hours; the extra payments for food and water; these are just some of the factors that have led public opinion in Italy to decry the existence of so-called ‘new slavery’. I know that in the newspaper they call us slaves. But as long as I make my money, I can stand it. But what do workers themselves make of this label? In Prince’s words: “I know that in the newspaper they call us slaves. I saw it. For me this thing of picking tomatoes, or other vegetables, it’s just a job. I’m not stupid, I know that we live in poor, very poor conditions, like animals, and we work a lot, too much, for little money. And the caporale or the Italian boss can be bad with me, but as long as I earn my money I can stand it, it’s ok[…]Do I think I’m a slave? Well aren’t we all slaves to something?”. Or, as Mohamed put it: “I am angry that they call us slaves, they call my African brothers slaves. We came here to work, not to suffer. Now I’m suffering, but I’m doing this for money. As soon as I find something better, I’ll go. I don’t want to be treated like a child. I know the situation, but what can I do? I stay until God wants”. Likewise Robert, who asked, “Why do they call us slaves? We are not slaves, but we work too much and we have no rights. Maybe for this reason they say this thing of slavery? Maybe it is true, but I can’t think of me as a slave. It’s a bad word’. Or Frank, whose awareness of the rhetorical power of the word to a Western audience was acute: “We work like slaves, we are slaves, not in chains, but we are. Look around you, we are here alone and we depend on the capo for everything, like real slaves depended on the slaveholder. I hope that you, all Italians, come and see how we live, how we work and change all this. No human being should live like this”. At this point, it is worth recalling the geographical provenance of these workers. The majority come from Northern and Upper Eastern Ghana. These regions served as a slave reserve during the trans-Saharan and the trans-Atlantic slave trade. But they were also sites of strong slave resistance. The memory of this slave past is still controversial and, in some cases, untold. Calling a worker a ‘slave’ evokes a past that is still sensitive, hence many refuse the term. If you come from a place which traditionally produced slaves and you find yourself trapped in a highly exploitative relationship, you try to distance yourself from such a definition. Or you use it as an instrument to raise awareness not of your own condition, but of that of your community. The voices of these workers must be at the centre of the debate on ‘modern slavery’ in the Italian agricultural sector. This is why I believe that the voices of these workers must be at the centre of the debate on ‘modern slavery’ in the Italian agricultural sector. The working biographies collected in ghetto Ghana reveal a high level of consciousness of the limits of the terminology of slavery and exploitation. What is seen as unbearable from the outside can, on closer inspection, seem tolerable and acceptable. This is not to deny the harshness of the human and labour rights violations that ghetto workers face. But it is to make a plea for outsiders to speak – and listen – to workers themselves. The ‘top-down approach’ to their protection claims to help them whilst simultaneously ignoring their lived experiences, worlds of meaning, and practices of resistance. This is a mistake. It is vital to involve migrant labourers in any policy effort. They are not just victims of abuse and subjugation, but also agents aware of their conditions. Above all, they bring with them a legacy of past slavery that still affects their notions of labour, dignity and self. What’s more, Italian analysis of contemporary exploitation and its links to past slavery need ‘to get structural’. When it comes to severe exploitation within Italian agriculture, for example, we simply cannot overlook the structure of the supply chain or the role that state migration policies play in fostering vulnerability. Likewise, when it comes to the use of the word ‘slavery’, we must advance discussion of Italy’s historical connections with slavery abroad and ‘slave-like’ exploitation at home. Italy was actively involved in Mediterranean slavery between the fifteenth and the nineteenth centuries, while caporali exploited Italian day-labourers in similar ways to today’s Ghanaians up until the middle of the twentieth century. Is there nothing that contemporary debates about ‘new slavery’ can learn from this history?